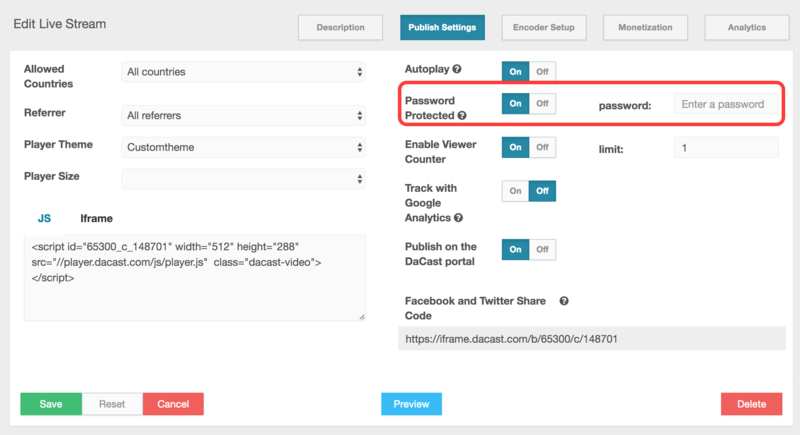 You can create password-protected live streams, VOD (video on-demand) files, and playlists over DaCast. Follow these simple steps to enact password protection on your stream today. First, log into your DaCast account. From there, access the PUBLISH SETTINGS tab (shown below). Make sure you access this tab for the content for which you want to add a password. From here, please note that you must turn on the “Password-Protected” feature (shown above). Once you enable this setting, a blank field appears. Now enter your password in this field. Please note that your password cannot exceed 10 characters. In the lower left corner, click SAVE to confirm your password entry. This SAVE updates account settings for this stream for your viewers. In other words, this particular content is now password-protected. Please note that this is the password your viewers must now enter to gain access to the stream. However, you do have to add a password to each video content to make it password-protected. Make sure your viewers have this information as soon as you update your stream settings. You can return to this tab to change the password later if needed. Note: This feature does not currently work with packages or on Facebook embeds. Looking for more information on how to create secure streams via DaCast? Check out this blog article on the features of a secure online video platform.